There’s something deeply satisfying about a bowl of vegetarian French Onion Soup. Traditionally, this dish features a rich broth of beef consume with onions sauteed to a dark color and a large crouton floating on top. All of this is smothered with melted cheese. 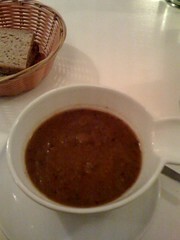 The soup makes you feel like a warm embrace by your favorite grandmother; if it’s possible to have a favorite. But alas, beef doesn’t sit well with the vegetarian in us. 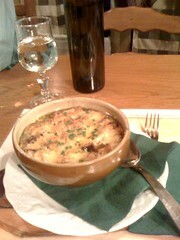 My favorite chef, Jacques Brosse, once created a heavenly French Onion Soup with a rich wine base for me. It was one of the best dishes I’ve ever tasted. Jacques is about to open a new restaurant in Paris, so watch for the news. The Onion soup had a rich broth but could’ve used more onions. Instead of a big hunk of crouton, the soup was dotted with smaller chunks. Frankly, the smaller chunks are much easier to manage. It was then covered with a thin layer of cheese. It was also a tad bit salty for my taste. The bread they served on the side was also a bit bland. Don’t get me wrong, Le Potager is a popular, friendly restaurant that features a great menu of vegetarian and vegan food. There were several daily specials, including vegetable curry, broccoli soup, and pasta primavera. The other diners licked their plates clean. The lady next to me just about died when her nattily atired boyfriend held his curry plate up and licked the last drop off. It’s just that the Onion Soup had a lot to live up to. It’s hard to beat a memory. 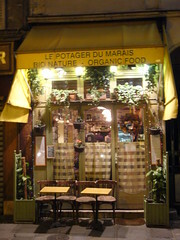 Le Potager du Marais is super easy to find. It’s just down the street from the Rambuteau metro. It’s a great place to get something to eat after spending a day at the Pompideu. Be forewarned, this restaurant is tiny and packed. It’s a good idea to make a reservation during peak hours. However, they are open for breakfast, lunch, and dinner. 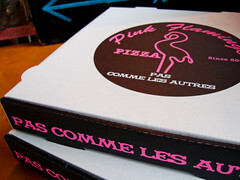 Surprisingly, they do not accept Cheque Dejeuner (subsidized lunch tickets for those that work in Paris). Wheelchair Friendly: This restaurant is not wheelchair friendly. It is very tight inside. Some cuisines are more likely to offer vegetarian options than others. It is difficult to find a good veggie option at a German restaurant, whereas Indian cuisine is filled with tasty dishes. Asian food is hit an miss, it is next to impossible to find veggie Pho, yet Thai and Korean are rather easy. I have tried a few Asian restaurants in Paris and their options have been limited. I even found an Indian restaurant with little for vegetarians. 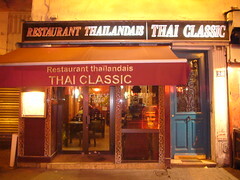 So, it is with great relief that I stopped off at Thai Classic in the Marais district. I knew I was going to be in luck when the fixed price menu featured a vegetarian option. They also offer 8 vegetarian plates and 5 starters. Take your pick from the standards: Tom Kha soup, spring rolls, glass noodles, red and green curries with tofu, and stir fried veggies. I ordered the fixed price menu. It starts with an aperitif, then follows with a bento-box like tray with egg rolls, fried rice, and salad. The food is delicious and satisfying. I also enjoyed the hospitality. I arrived just after they opened and before the main crowd arrived. I shared the restaurant with a couple from New Zealand and the owner visited during the meal. Parisians typically eat in restaurants after 8 p.m.. Early diners will usually find less crowds, more attention, and a quiet dinner. You’re also more likely to have tourists to talk with. This restaurant has a lot of competition for your vegetarian dollars. 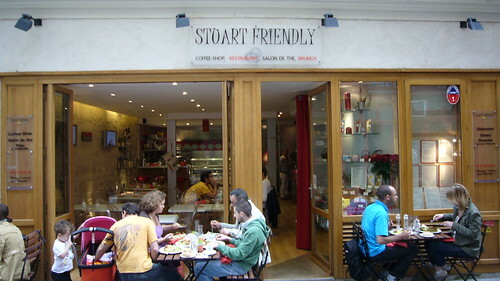 It sits near the very popular La Victoire, Falafel alley, Potager de Marais, and many italian and french restaurants with vegetarian options Try this restaurant when you are craving some Thai food. It also features a full meat menu, so your meat-eating friends will enjoy it as well.